Agonising defeat some six months ago in the gold medal contest at the Seamaster 2017 ITTF World Tour Grand Finals in Astana, Kazakhstan when being in a winning position; on home soil, Ho Kwan Kit and Wong Chun Ting extracted revenge. In the final of the Men’s Doubles event at the Seamaster 2018 ITTF World Tour Hang Seng Hong Kong Open on Sunday 27th May, they extracted that revenge in clinical manner; the no.3 seeds, they beat Japan’s Masataka Morizono and Yuya Oshima, the no.5 seeds, in three straight games (11-6, 11-2, 11-9). 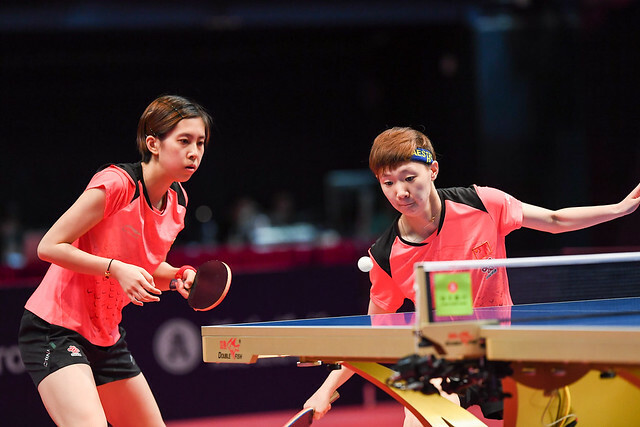 Spurred forward by the excited and passionate crowd in the Queen Elizabeth Stadium, Ho Kwan Kit and Wong Chun Ting secured the first game before in the second moving to whole new level. Exuding confidence they established a 9-1 lead, surrendering just one more point before securing the game. They were the dominant pair with Wong Chun Ting very much directing operations in the role of team captain, exhilarating counter topspin play being the forte and delighting the crowd. Two games to nil in arrears Masataka Morizono and Yuya Oshima never wilted, trailing 7-8 in the third game they elected for “Time Out” but the break did not bring the effect they had hoped. At 10-7 Ho Kwan Kit and Wong Chun Ting held three match points; the Japanese duo fighting for their lives secured the next two points. Hong Kong coach, Liu Guodong, sitting courtside, called “Time Out”, the break worked, Hong Kong celebrated. Notably it was the second career ITTF World Tour Men’s Doubles title for Ho Kwan Kit and Wong Chun Ting; the one previous success was in 2016 when they had won in Slovenia beating Korea’s Jeoung Youngsik and Lee Sangsu in the final. Somewhat differently it was the seventh such ITTF World Tour final for Masataka Morizono and Yuya Oshima; significantly it was their first defeat in a title decider. The only other reverse in a final was in the Seamsaster 2016 ITTF World Tour Grand Finals when they lost to Jeoung Youngsik and Lee Sangsu.